I love looking at kites flying high in the sky. 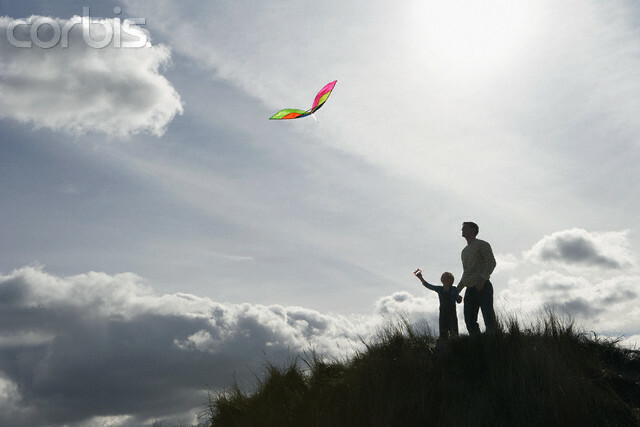 I remember the first kite I ever had was a butterfly kite my dad bought for me one beach holiday. I loved it, although it was not a good flier. I could not wait to hold the string all by myself, and begged my dad to let me try it on my own. In my young mind I thought it would fly better if I were to let go of the string, but although it took off with a great "whoosh", it soon tumbled from the sky and got tangled in the undergrowth. Painstakingly my dad untangled it and we tried again. From a very young age we have been raised to do things for ourselves. Almost from the moment our children are born we encourage them to become independent, we are ecstatic when they start sitting up by themselves, we applaud them when they can hold onto their own bottle and we are ready with the camera to record their first unaided, wobbly steps. Day by day we marvel at how their independence grows. Of course there is nothing wrong with that, it is the natural way of life. However, the problem comes in when we become so independent, so self-sufficient, that we start believing we need nobody else, we can do it all, we are an island. This type of thinking will lead you on a bitter and lonely road. "Needing people" is seen by fiercely independent people as a weakness. They believe that they have to be a Superhero, strong, undefeatable, self-sufficient, powerful. They never ask for help, never admit defeat and never open up to anybody. They even experience God as an entity outside of their lives, remote from their lives. To accept and receive anything is foreign to their whole being. Very often they not only distance themselves from other people, but they even distance themselves from their own feelings. People need people. We have to connect with others, learn from others, inspire others and in turn be inspired by them. Independence that is out of control is actually just a mask to hide behind. Behind the mask often lurks fear, pride and low self-esteem. It is a way to protect ourselves from disappointment, hurt or rejection. 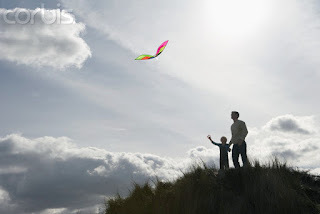 Looking up at the sky, watching the kites ducking and diving in the breeze, I relate it to the way life is. Although the kite is tethered by the string, it sails through the air and rides the wind with such freedom, such abandon that it leaves me breathless with excitement. As my dad explained that day on the beach, it is the very fact that it is held by the string that it can fly so high and so gracefully. The minute my little hands let go of the string, my kite's future was lost and all it could do was to tumble down and crash. It needs that connection, that guiding hand to fly. The same way we need to be connected to God, to interact with others as it is in that connection and that interaction that we find our true strength, new inspiration and freedom. I leave you with a quote from a song by Barbra Streisand : "People who need people are the luckiest people in the world!" If you flutter by here and would like to share your thoughts please feel free to do so.